This slim, beautifully written novel begins one evening when, ordering a meal at a bar, Tsukiko sits next to an elderly man who chooses exactly the same dish. She recognises him as her teacher from her secondary school days but cannot remember his name saying nothing until he notices her. To cover her embarrassment she calls him Sensei, and will never call him anything else. They begin by occasionally bumping into each other at the bar, then becoming regulars pulling the barman into their orbit and going with him and his cousin on a mushroom hunt. Sensei is a pedant, constantly correcting Tsukiko but never irritating her – she is a loner, unaware of her isolation until her feelings for him begin to change. She flounces off from a cherry blossom party with an old school flame in a fit of pique at what she perceives as Sensei’s exaggerated interest in the attractive art teacher but somehow she can’t return the younger man’s interest. Sensei invites her to go away with him but they sleep in separate rooms. She avoids him for months but can’t forget him. Then they meet again. Expertly translated by Allison Markin Powell this is a beautifully understated love story, a novel of sadness, longing and gentle humour. 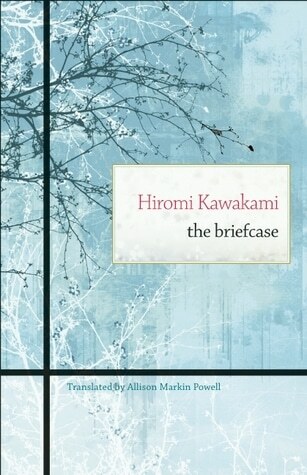 Although it was written in 2001 as far as I know it’s the first novel by Hiromi Kawakami to be published in the UK but I hope there will be more. Portobello Books have done a brilliant job in packaging the novel. A fellow blogger told me that it was published in the US with a rather uninspiring cover under the title The Briefcase which makes complete sense if you’ve read the book but sounds a bit dull if you’re browsing. In contrast, Portobello’s title is intriguing and the book’s jacket is a thing of beauty that makes you want to pick it up and start reading. I hope lots of readers will. This entry was posted in Reviews and tagged Allison Markin Powell, Hiromi Kawakami, Portobello Books, Strange Weather in Tokyo, The Briefcase on 30 August 2013 by Susan Osborne.